You Save: $99.78 (63%) Ships in 1 day. Comments: Book shows minor bumps and wear, otherwise clean and strong inside and out. Hard Cover, 200 pages, 7.00 x 9.75. 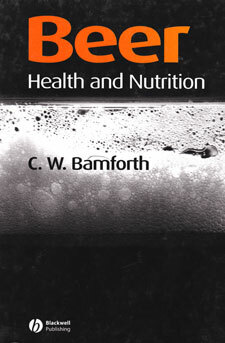 This important and extremely interesting book is a serious scientific and authoritative overview of the implications of drinking beer as part of the human diet. Coverage includes a history of beer in the diet, an overview of beer production and beer compositional analysis, the impact of raw materials, the desirable and undesirable components in beer and the contribution of beer to health, and social issues. Written by Professor Charlie Bamforth, well known for a lifetime's work in the brewing world, Beer: Health and Nutrition should find a place on the shelves of all those involved in providing dietary advice.